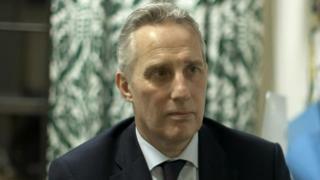 The Parliamentary Standards Commissioner has responded to two politicians who called for DUP MP Ian Paisley to be investigated over a complimentary holiday to the Maldives. But SDLP leader Colum Eastwood and Sinn Féin MLA Phillip McGuigan have told BBC's The View programme they have been warned against revealing the details of the correspondence as they could be in breach of parliamentary privilege. Under the new complaints and grievances scheme at Westminster the Standards Commissioner is no longer allowed to reveal details of inquiries, including naming MPs under investigation. The information will only be made public once the investigation is completed. He added: "I don't see how it serves the democratic interest at all." The changes were introduced last year to make it easier for those reporting allegations of harassment and bullying to come forward. The former chair of the Parliamentary Standards Committee Sir Kevin Barron opposed the move in the House of Commons. "Because we introduced the issue of bullying and sexual harassment, they decided they would anonymise these types of inquiries, which was fine," Sir Kevin told The View. "What we didn't agree with was to anonymise investigations under the current code of conduct." He added: "If anyone is in breach of the current code of conduct, not through sexual harassment or bullying, their names should be in the public domain." The Standards Commissioner Kathryn Stone also expressed concern at the move describing it as a "retrograde step" in an newspaper article. "She was adamant that she should be able to put people's names in the public domain like she has done in the past and, don't forget, she only puts those names out there if evidence is given to her," explained Sir Kevin. Sinn Féin's Phillip McGuigan said the process needs to be more transparent. "In my correspondence I alerted the parliamentary commissioner to the media coverage of Ian Paisley and his family holidays to the Maldives and the allegations that were put into the public domain at that time," he said. He added: "In my opinion, those were worthy of another investigation." The changes to the complaints and grievance process were voted through last July - on the same day Ian Paisley apologised in the House of Commons for breaching the rules on paid advocacy over two holidays to Sri Lanka. Mr Paisley did not vote for the changes. He was due to meet the standards commissioner to discuss the allegations around his trip to the Maldives. A BBC Spotlight investigation broadcast in December suggested Mr Paisley was given the holiday in the Maldives months after advocating on behalf of its government. The programme examined whether the MP should have declared the trip in 2016. Mr Paisley said he paid for part of the holiday and the rest was paid for by a friend. The North Antrim MP did not reveal the identity of this friend. He said the friend was unconnected with his work and has received no benefit as a result of his work. Mr Paisley, his wife and two sons stayed at the resort in the Maldives for six days in the autumn of 2016. Months before, Mr Paisley and two other politicians had visited the Maldives. At the time, international organisations including the UN were criticising the country's government over human rights abuses. Mr Paisley argued against economic sanctions. The BBC's The View will be broadcast on BBC One Northern Ireland at 22:40 GMT on Thursday, 31 January 2019.